More than Just The "Rain Man"
The term “savant” refers to a person handicapped by a mental or physical disability, yet possesses an extraordinary skill or talent in spite of this disability. Dr. J. Langdom Down was the first to recognize savant syndrome, and in 1887 he first used the term “idiot savant”. Originating from the French word “savoir” (meaning “to know”), this term was used to describe someone with "extraordinary memory but with a great defect in reasoning power." Savant syndrome is seen in different levels of talent, but nonetheless they're found in persons affected by autism, developmental disabilities and other diseases; some even develop savant syndrome after damage to the central nervous system. Extraordinary memorization skills lies at the base of savant syndrome. Christopher shows extraordinary memorization skills in his claims at the beginning of the book, where he states "I know all the countries of the world and their capital cities and every prime number up to 7,067." Not all savants are autistic, despite the term “savant” being closely affiliated with those with autism. 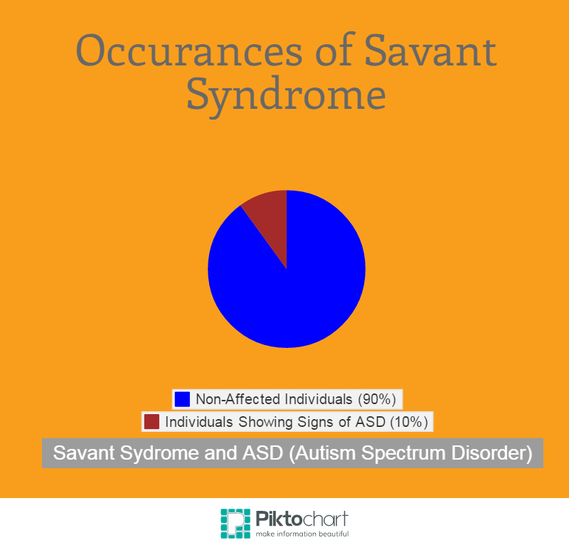 The number of autistic savants only account for half of all cases, with around 10% of autistic population showing signs of savant syndrome. Only 1% of the learning disability population shows signs of savant syndrome, while they make up the other half of all savants. However, we must keep in mind that the learning disability population is much higher than the autistic population. Christopher is seen to be a savant, as he suffers from ASD. When he reflects upon himself as a child, he states, "That was because when I was little I didn't understand about other people having minds." Throughout the book, he's seen to cease to function in situations regarding large groups of people. For example, while he was in the train station, Christopher found the entire scenario overwhelming, so he "groaned to to cover up the noise because I had taken my hands off my ears, but not so loud that other people would hear me groaning and come and talk to me." 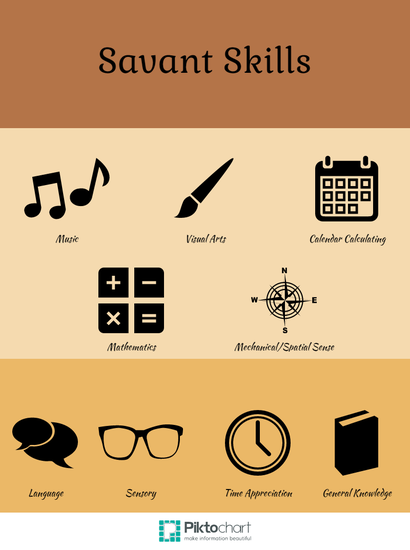 The skills of a savant generally fall under one out of five categories; music, art, calendar calculating, mathematics or mechanical or spatial skills. Despite the copious number of things that we humans are capable of, it’s rather peculiar that most savants’ skills fall into these five areas of expertise. Though most savant skills fall into these five categories, there are a few exceptions. Other reported skills include exceptional language skills (the ability to learn, read, write, or speak multiple languages with ease), an uncanny ability in sight, smell, or touch (even synesthesia, a condition where two or more senses are merged together), the ability to know just how much time has passed solely based on intuition, or an enormous mental knowledge database to use at their pleasure. Christopher has extraordinary talent in the fields of mathematics and general knowledge (in physics, or other tidbits of knowledge), as he is repeatedly shown to excel in mathematics (by passing the A level maths with flying colours) and even finds comfort in his equations. While under pressure, he uses problems like "Conways Soldiers" to distract himself from his surroundings, like a coping mechanism of sorts. It's his escape from scenarios that he finds to be overstimulating. Savants are shown to have dedicated a large portion of time to practising their special talent, but this cannot account for the sheer amounts of skill that they have. The amount of talent shown in savants in early childhood remains a mystery, as many savants do not have access to training nor opportunities to practice their talents. Studies have shown that the way savants perfect their skills through obsessive behaviour is unlike their non-autistic counterparts (though not all savants are autistic). A ‘three-factor model of high ability’ (a term used by Trehub and Schellenberg, child psychologists) that is normally associated with high achieving persons is not seen in savants, as their talents do not stem from the usual routine of goal setting, evaluation, and feedback. Hiles, Dave. "Savant Syndrome." Savant Syndrome. Wisconsin Medical Society, n.d. Web. 10 Nov. 2014. <http://www.psy.dmu.ac.uk/drhiles/Savant%20Syndrome.htm>. Treffert, Darold A. "The savant syndrome: an extraordinary condition. A synopsis: past, present, future." Philosophical Transactions of the Royal Society B: Biological Sciences 364.1522 (2009): 1351-1357, n.d. Web 10 Nov. 2014. <https://www.wisconsinmedicalsociety.org/_WMS/savant/pdf/resources/articles/savant_article.pdf>. Pring, Linda. "Savant Talent." Cambridge Journals Online. Developmental Medicine & Child Neurology, 16 June 2006. Web. 10 Nov. 2014. <http://journals.cambridge.org/action/displayFulltext?type=1&fid=313208&jid=DMC&volumeId=47&issueId=07&aid=313207&bodyId=&membershipNumber=&societyETOCSession=>.